Formica is a tough, resilient and easy-tomaintain laminate material. Formica comes in a variety of styles, colors, patterns and prices, making it fit into any budget or decorating theme. Installing Formica on shower walls requires the proper base to avoid future water and moisture problems behind the laminate surface. 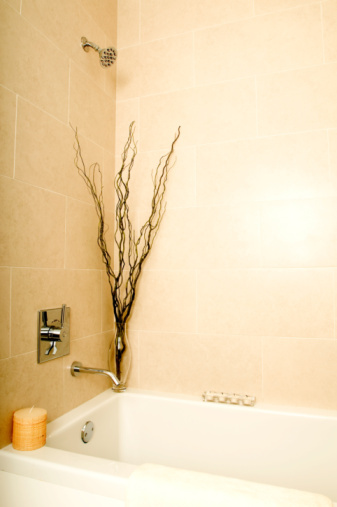 Cement backer board, which is a cement-based material similar to drywall but impervious to water and dampness, is the optimal base for shower walls. Create a custom shower space with Formica. Shut off the water supply to the shower from the main line. Remove the existing wall covering to expose the bare wall. Replace drywall or green board with cement backer board. If cement board exists, hammer in any protruding nails. Fill in depressions with joint compound. Sand the entire wall with fine-grit sandpaper to smooth high spots, and remove old adhesive, if applicable. Remove the faucets, escutcheons, shower heads, shelves and plumbing handles. Apply a coat of water sealer to the cement backer board with a paintbrush or roller. Allow the sealer to dry fully, usually two to three hours. Create a paper template to mark cutouts for plumbing pipes and fixtures: Tape kraft paper onto the existing wall and trace around the areas that require cutting. Remove the kraft paper and cut out along the drawn lines with scissors. Place the paper template over the unfinished side of the Formica and trace the cutouts onto the Formica with a pencil. Place masking tape over the guidelines and redraw the lines. Masking tape helps to prevent Formica from cracking when cutting. Lay the Formica down on an even, level surface and cut along the guideline with a sharp utility knife. It will take several passes to cut through the Formica. Measure and mark straight cuts on the back of the Formica, or create a paper template of the walls and trace the template onto the unfinished side of the Formica. Place masking tape over the cutting lines to prevent the Formica from splitting and cracking. Redraw the guideline on the masking tape. Cut along the guidelines with a utility knife; use a metal straightedge as a guide, or equip a circular saw with a high-tooth-count saw blade and cut with the saw. Place the sheet of Formica on a stable workbench and clamp it in place with "C" clamps. Follow the guidelines with the saw. Using a high-tooth-count blade will result in a smooth cut. Load a caulking gun with construction adhesive. Deposit dime-size dots of the adhesive every 4 to 6 inches over the entire unfinished side of the Formica. Begin and end at the edges. Position the Formica up against the wall and press in place. Wipe up excess adhesive immediately with a damp rag. Hold a dry, soft rag in your hand and run the rag over the entire surface, while pressing the Formica to the wall. Continue to run your hand over the surface, pressing the Formica to the wall, for 5 to 10 minutes while the adhesive sets. Construction adhesive dries quickly. Continue to apply adhesive to the back of the sheets of Formica and press in place until all of the shower walls are covered. Load a caulking gun with silicone caulk and run a bead of caulking along the corners and top and bottom seams of the Formica. Replace all plumbing fixtures. Allow the caulk to dry for 24 hours before using the shower.